Discover the magic of Zimbabwe while on an intimate tour through this breathtakingly beautiful country. 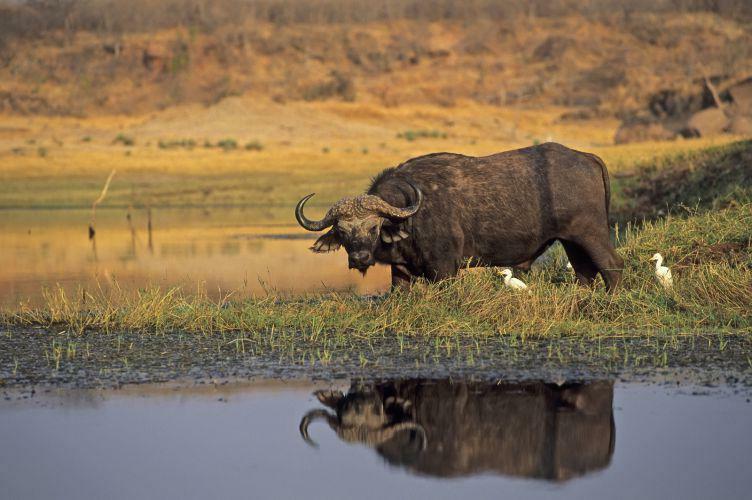 Venture into Zimbabwe’s most famous national parks such as Hwange and Matobo National Park. Learn more about Zimbabwe’s fascinating history on a visit to the 900-year-old Great Zimbabwe Ruins rumoured to be the capital of the legendary Queen of Sheba and also the namesake of the nations, Zimbabwe comes from a Shona word for” big houses of stone”. Throughout your trip, you will experience true Zimbabwean hospitality. Our journey today brings us to the shores of Lake Kariba. It is one of the world’s largest man-made lakes and a place of outstanding beauty. At over 220 km long and 30 km at its widest point it is no wonder it is referred to as an inland sea! The lake is nested in mountains, guarded by enormous reserves of game and made beautiful and savage by sun and storm, as well as by earth and water. After lunch we arrive at Masuma River Lodge, which is in a spectacular location with magnificent views over the islands and waters of Lake Kariba’s western side. Spend the day relaxing at the pool, or option to partake in many of the optional activities. 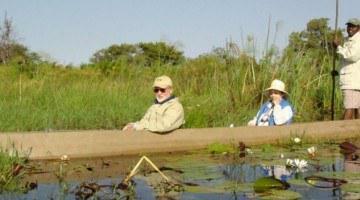 Afternoon sunset cruise on Lake Kariba with game-viewing opportunities. This morning we make our way to the Northern Section of Hwange National Park. Over the following two days, we will have plenty of time to explore this vast wilderness on game drives. 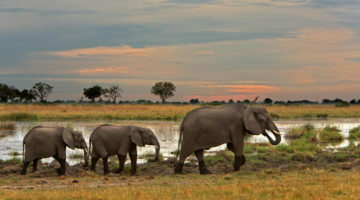 Hwange National Park is one of Africa’s finest havens for wildlife and is home to great herds of elephant, buffalo, and zebra and has a very large concentration of giraffe. 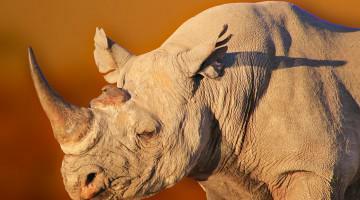 It is also home to many predators and endangered species plus varied birdlife. The whole of the next day is spent exploring this magnificent area on a full day game drive in Hwange National Park. Today we head off to our lodge situated in a private concession near Hwange National Park.On the next day we will visit the Painted Dog Conservation Centre to witness the work that is done to protect this endangered species. If time allows, you can partake in an open vehicle game drive on the concession in the afternoon. After breakfast we travel southwards to the majestic Matobo Hills, an area of exquisite beauty, steeped in tribal history, ancient mystery and dramatic rock landscapes. The national park has been given UNESCO World Heritage status and is home to both white and black rhinoceros, sable antelope and the world’s densest population of leopard. Birdlife is prolific and includes the highest concentration of black eagles in the world. Once the home of the San (Bushman), this area contains the richest source of the rock art found anywhere. Not only is it here that the Ndebele people buried their great king, Mzilikazi, but Cecil John Rhodes was also laid to rest on the “Hill of the Benevolent Spirit” or “World’s View” as named by him. We spend the next day in the national park, starting our morning with tracking rhino spoor by vehicle and foot. In the afternoon we further explore the scenery and wildlife of the park on game drives, ending with a visit to Rhodes’ grave. Our safari ends after breakfast. You will be transferred to Victoria Falls Airport in time for your departure flight. We hope to welcome you again one day on another of our African adventures! The perfect platform from which to explore the Natural Wonder of the majestic Victoria Falls. Victoria Falls accommodation at Ilala Lodge Hotel provides distinguished yet affordable accommodation in a gracious and secluded ambiance. Ilala Lodge Hotel is ideally situated on the Zimbabwean side of the falls and is the closest hotel to the Victoria Falls as well as the Vic Falls town centre. Wild animals often graze on the hotel lawns with the spray of the falls in the background. Twin Rooms with 2 large three-quarter beds in each. All rooms have en suite bathroom with separate shower, air conditioning, overhead fan, satellite TV and have individual coffe and tea facilities. The rooms are spacious with railway teak furnishings. Located on river bank of Lake Kariba in the Binga area, Masumu River Lodge is the perfect place to escape the world and explore nature in Africa. Masumu River Lodge offers a range of activities during your stay which includes: fishing on lake Kariba, beautiful sunsets cascading over the picturesque views in the surrounding area. Masumu River Lodge offers twin room lodges, all of which are self catering. Each lodge has: en-suite bathrooms, ceiling fans, air conditioning, mosquito nets, beautiful pool side views, and secure parking beside the chalets for vehicles. The main communal entertainment area with kitchen includes: bar, braai, dining area and splash pool. All linen, cutlery, crockery, glass ware and kitchen utensils provided. Bar, kitchen fridges and a chest deep freeze provided housekeeping is provided for your convenience. The main lodge has a fully stocked cash bar and assortment of wines. Boat and driver hire for fishing or a cruise on the lake are available and is arranged at the lodge. Fuel and National Park fees are paid directly at the lodge. Sable Sands has 11 traditionally thatched rondavels. Part of the ancient royal hunting grounds of King Lobengula, the lodge was later visited in 1991 by her Royal Highness, Queen Elizabeth II, and Prince Phillip…so it’s no wonder the designed bedrooms have added luxury complete with private terrace, and en suite bathroom, making your rondavel the perfect blend of ancient culture, nature and modern convenience. This African forest home also has a refreshing swimming pool, a stunning main building with dining area, lounge, loft, library, bar and terraced landscaping. From here you overlook the famous Dete Vlei, the long dried up river, which today frequently hosts wildlife visitors at the water holes. Here you have a chance of seeing sable antelope, giraffe, zebra and big herds of elephant and buffalo, lion, cheetah, painted dog, jackal and more. The Vlei is also renowned for its incredible bird population, believed to be no less than 350 different species in all. Sable Sands is a partnership between the Forestry Commission of Zimbabwe, Moivaro Lodges & Tented Camps and co owner managers Brian (Zimbabwean) and Marleen (Dutch), former managers of Sikumi Tree Lodge, which won several awards during their tenure. Passionate guides, chefs and waiters complete the team that shares with you the rich history, folklore, culture and habits of the inhabitants of this magical forest. They love to take you on an early morning bush breakfast or surprise you with a romantic drive under the starry African skies. Live and experience the wonder of this amazing forest and vlei which keeps surprising everyone, every day, every season, each creature holding a promise of natural discovery, adventure, joy and beauty each day. Rondavel cottage with thatched roof, twin or double bed arrangement. Extra beds can be added for family room. All rooms have en-suite bathrooms with shower, wash hand basin, toilet, towels and luxurious bathroom amenities, large mosquito nets and solar lights at night (when the silent generator is switched off). The Bushman’s rock estate is more than a place for bed and board, it is a sanctuary for rest and relaxation. Situated approximately 40km from Harare this location is a worthwhile getaway which has all the features of an exclusive nature retreat. Guests can look forward to comfortable lodging, some peace & fresh air as well as a range of relaxing activities suitable for young and old. The Valley view lodge is set on a well-manicured portion of the estate which is surrounded by a magnificent river front view, the valley beneath and large forest. Accommodation options on offer include double rooms, family suites and twin rooms which may be booked in advance. The lodges are spacious thatched units which come complete with coffee and tea making facilities, mini bar, fireplace, ensuite bathroom and shower, private patio and a fire place. There are several activities to choose from during one’s stay. These include, water activities such as canoe fishing, pontoon rides and swimming at the central lodge pool. The Bushman’s rock estate boasts of a modest wildlife population and so guests can enjoy a mini safari as they go on game drives or game walks. Another way to explore the interesting flora and fauna, is to go horse riding. There is also the rare opportunity to tour the vineyards and do some wine tasting. For a cultural aspect to the outing there are also rock paintings in nearby caves were people can hear more about the local history.